Do you need to become a FINRA Compliance Officer? Do you enjoy taking securities licensing exams? If your answer to both questions is yes, then you can take the Securities Industry Essentials (SIE) exam, the Series 7 General Securities Representative exam, and the Series 24 General Securities Principal exam. Nearly 400 questions of securities exam fun. But if you need to become a FINRA Compliance Officer and you do not have a passion for taking securities licensing exams, you’re in luck! Since October 1, 2018 individuals who want to become a FINRA Compliance Officer can take the FINRA Series 14 Compliance Officer Qualification exam instead. Just 110 questions. “We’ve helped thousands pass the Series 7, the Series 24 and the SIE exam,” Jeremy Solomon, President of Solomon Exam Prep, “we recognize that some people don’t love to take securities exams.” For those designated by their firm as having day-to-day compliance responsibilities or who supervise ten or more people engaged in compliance, FINRA has made the former NYSE Series 14 exam, the new alternative pathway to the Compliance Officer qualification. Now, with the Solomon Exam Prep Series 14 Exam Study Guide and Solomon Exam Prep Series 14 Online Exam Simulator, becoming a FINRA Compliance Officer has never been easier. Get these products bundled together for 10% off in the Solomon Exam Prep Series 14 Essentials Package. Author ProfessorPosted on April 16, 2019 April 16, 2019 Categories Exam Study Guide, FINRA, Series 14Leave a comment on Do you need to become a FINRA Compliance Officer? Solomon Exam Prep has published study materials for professionals required to take the upcoming Series 50 permanent exam. Portland, OR, August 22, 2016. 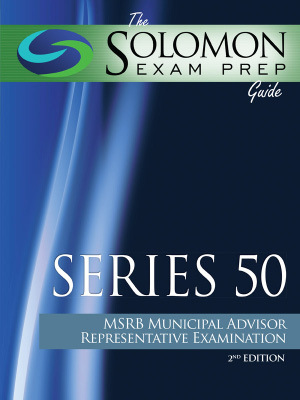 After helping hundreds of individuals study and pass the MSRB Series 50 Pilot Exam, Solomon Exam Prep is proud to present a new, revised, and updated Series 50 exam prep program. The new program contains over 1,250 original practice questions. “We were pleased with our students’ success on the Series 50 pilot exam: an 93.87% pass rate versus the national Series 50 pass rate of 84%. And we are excited to announce the launch of the Solomon Series 50 exam prep program,” said Jeremy Solomon, president of Solomon Exam Prep. “The MSRB updated and revised their Series 50 exam content outline and we responded to the regulators’ exam content changes, as well to student feedback from the pilot exam. For example, we added and updated material on MSRB Rules G-20, G-37, and G-42 governing activities of municipal advisors,” said Jeremy Solomon. 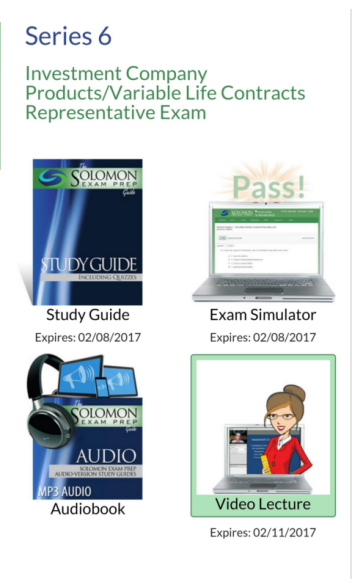 The Solomon Exam Prep Series 50 study program includes a Series 50 Exam Guide (digital and hard copy), a Series 50 Exam Simulator, and a Series 50 Video Lecture. Solomon Exam Prep’s innovative technology lets students study anytime, anywhere. Informed by Professor Karen Solomon’s Ph.D. research on learning and memory, Solomon study materials emphasize learning then practicing, learning then practicing . 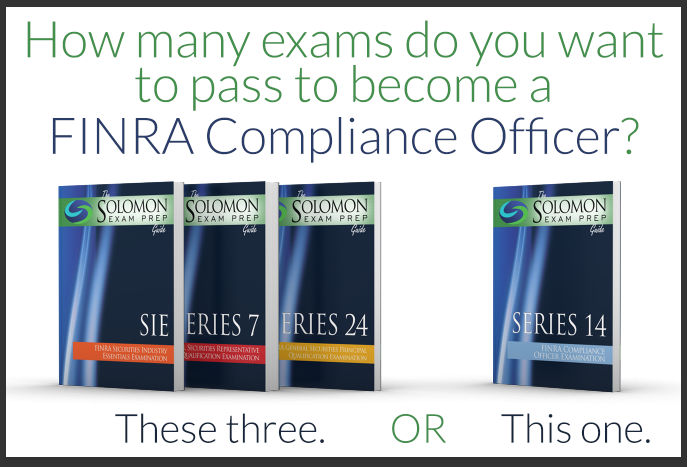 . . With over 1,250 original practice questions, Solomon Series 50 students have a deep and robust pool of practice questions to hone their Series 50 exam knowledge and give them the active knowledge they need to pass the test. “Practice really does make perfect,” says Jeremy Solomon. Five decades in the muni business didn’t guarantee I’d pass the Series 50 pilot exam. (Just knowing content doesn’t mean you are ready for the test.) Thankfully, my Solomon Exam Prep materials were fantastic at teaching complex subject matter in a way that made the answers clear, and I passed the test with ease. 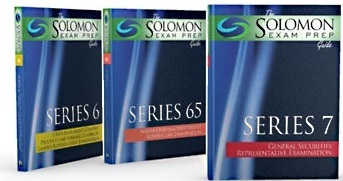 If you plan to take the Series 50 exam, then I strongly recommend that you give yourself the edge that Solomon’s study materials provide. Updated Series 63, 65, and 66 Materials Now Available! On July 1, the North American Securities Administrators Association (NASAA) updated the Series 63, Series 65, and Series 66 exams. That means new material was added to the tests—material you need to know if you want to pass. That’s where Solomon comes in. We updated our Series 63, Series 65, and Series 66 Study Guides and Online Exam Simulators so our customers don’t have to worry about being left behind by these changes. You can purchase each Exam Study Guide with our industry-leading Online Exam Simulator as part of our Essentials Study Package. For a limited time, Like us on Facebook to get a coupon code for 10% off packages! Want more information? Call 503.601.0212 or go to SolomonExamPrep.com. Author ProfessorPosted on August 11, 2016 August 11, 2016 Categories Exam Study Guide, FINRA, Series 63, Series 65, Series 66Leave a comment on Updated Series 63, 65, and 66 Materials Now Available! On average, book readers live 23 months longer than individuals who don’t read books. “Cognitive engagement may explain why vocabulary, reasoning, concentration, and critical thinking skills are improved by exposure to books,” they write. Second, books “can promote empathy, social perception, and emotional intelligence, which are cognitive processes that can lead to greater survival,” they say. In addition to improving their chances of living longer, securities exam students are likelier to pass and pass with a higher score, if they read an exam guide, according to Jeremy Solomon, president of Solomon Exam Prep. 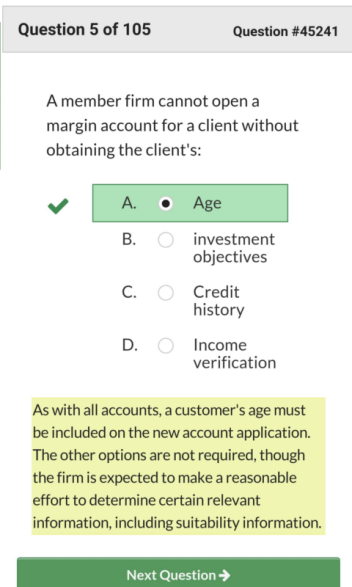 Regulators have set the bar high for this exam for a simple reason: the Series 66 exam, in conjunction with the Series 7 exam, qualifies you to be a securities agent and an investment adviser representative, so you must know what you’re talking about when giving investment advice or effecting securities transactions. This means that you need to know a lot of information, including the three types of securities registration, the nine types of investment risk, the difference between the strong, semi-strong, and weak forms of the EMH; when a securities professional is permitted to sell non-exempt unregistered securities (never); who may issue a stop order to deny, revoke, or suspend; when rescission is allowed and by whom; what contumacy is and how to avoid it; what prudent investor, suitability, and fiduciary mean—and more! 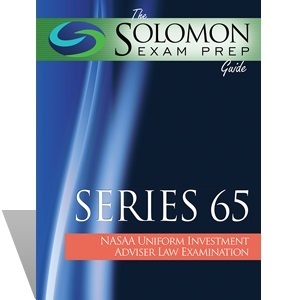 The comprehensive Solomon Exam Prep Guide to the Series 66 Exam works in three mutually reinforcing ways: it focuses on the most important aspects of the exam, provides you with plenty of practice questions, and continually reminds you why you have to take the test in the ­first place: to protect investors. 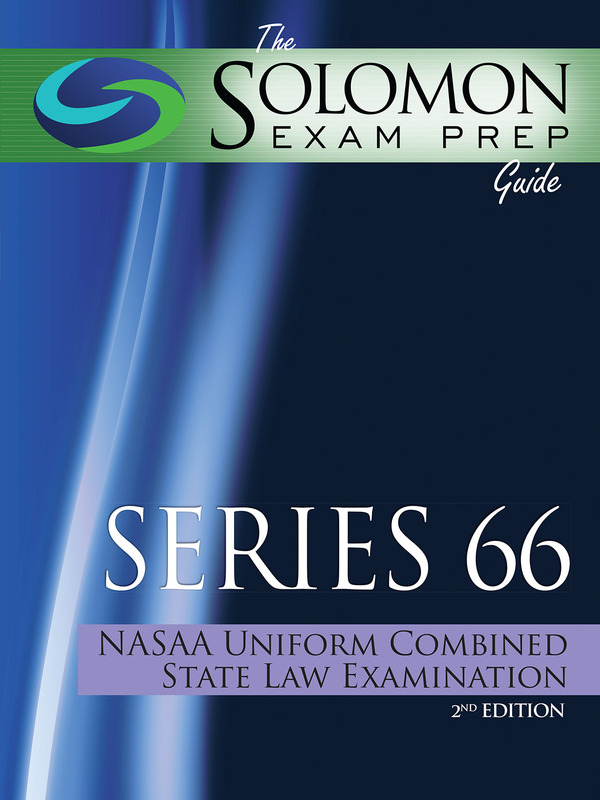 With practice questions at the end of each chapter, as well as a helpful glossary, the Solomon Exam Prep Guide will give you the knowledge to tackle the NASAA Series 66 Uniform Combined State Law Examination with confidence! Solomon Exam Prep has been publishing study materials for securities exams for over ten years. 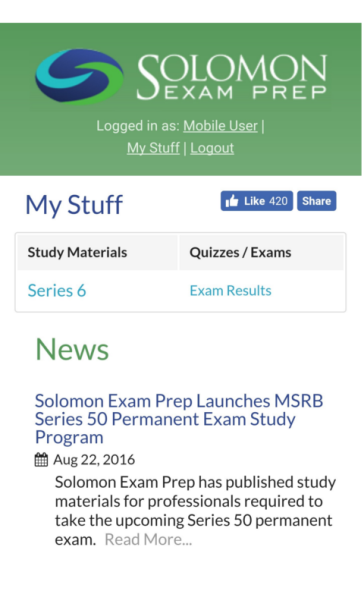 Keeping our materials up-to-date and constantly adding product offerings is just part of the reason why Solomon Exam Prep boasts a first-time pass rate of 92% across all exams with thousands of happy customers. To ring in the New Year, Solomon Exam Prep is pleased to announce the publication of new Exam Study Guides for the FINRA Series 6, FINRA Series 7, and NASAA Series 65. Updated for 2015, Solomon’s Exam Study Guides are the key to helping you pass your exam! Author ProfessorPosted on January 22, 2015 Categories Exam Study GuideTags exam prep, Exam Study Guide, FINRA Exams, NASAA Exams, Series 6, Series 65, Series 7, Study Guide, study materials, updatedLeave a comment on New Solomon Exam Prep Study Guides! 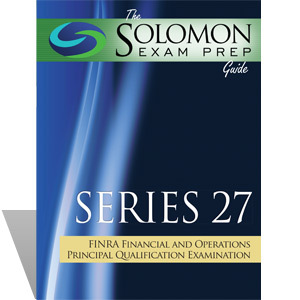 In response to the new FINRA Series 24 outline, Solomon Exam Prep restructures its Series 24 Exam Study Guide giving Solomon students the most up-to-date Series 24 study materials available. Solomon Exam Prep is pleased to announce the publication of the online study guide, “The Solomon Exam Prep Guide: Series 24 General Securities Principal Qualification Examination, 2nd Edition” (https://solomonexamprep.com/series24/exam-study-guide). As of October 13, 2014 FINRA has revised the Series 24 General Securities Principal Exam outline to include new rules and laws, including the adoption of rules from the consolidated FINRA rulebook. The new Series 24 exam outline will be categorized by function, rather than by the current sections. In addition, in the new Series 24 each function will include specific tasks describing activities associated with performing that function, similar to the revised Series 7 and Series 6 exam outlines. This brand-new edition reflects the revised FINRA exam outline format for October 2014, and includes the latest information on asset-backed securities, including new sections on Regulations AB and ABII and static pool analysis. Written by Karen Solomon, Ph.D., and Al Schaller, M.A., the guide works in three mutually reinforcing ways: it focuses on the most important aspects of the exam, it provides the reader with plenty of practice questions with detailed rationales, and it continually reminds them of the importance of taking the test in the first place: to protect investors. For more information, or to order “The Solomon Exam Prep Guide: Series 24 General Securities Principal Qualification Examination, 2nd Edition,” please go to: https://solomonexamprep.com/series24/exam-study-guide.